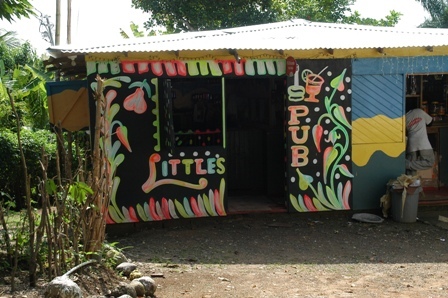 So after several conversations and a few emails Dub In A Pub is now a proper event, on 30th August we’re taking a selection of our favourite dubs and spending the afternoon playing them in the beer garden of my local pub (The Marsh Harrier in East Oxford) expect a mix of the big names (King Tubby, Augustus Pablo, Scientist, Lee Scratch Perry) but also plenty more obscure dubs, a chance to listen to dub, drink a few pints and chat about this great music with like minded souls. 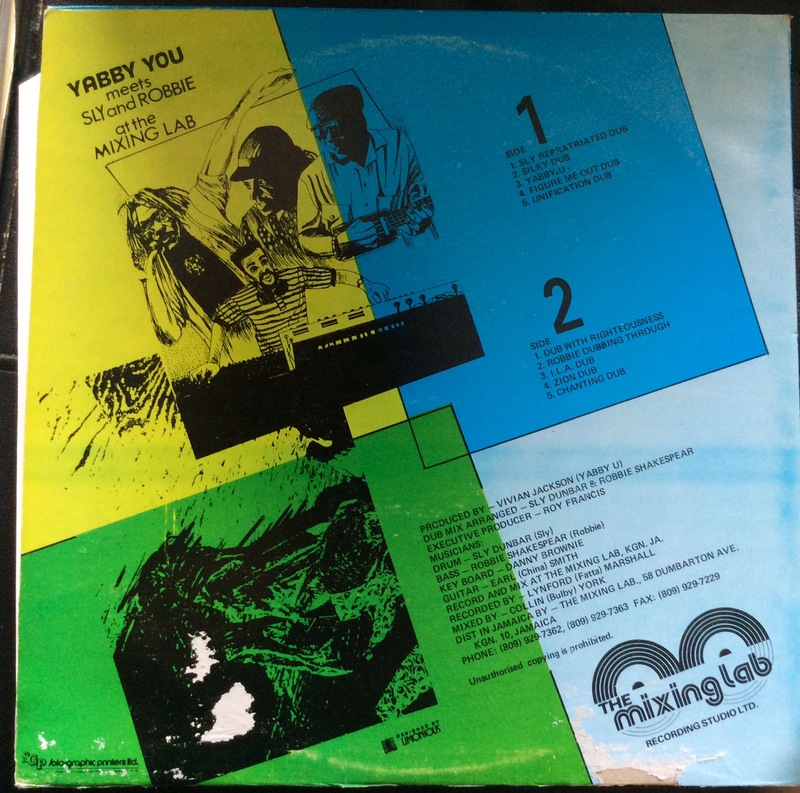 Having embarked on my dub journey I was drawn very much to 1970’s/early 80’s dub and was keen to seek out albums and compilations from this period, so much of this great music was difficult to buy back in the day (due to extremely limited pressings) and years later more and more of it has been reissued for both the vinyl and CD buying market. Dub reissues over the years have sometimes been controversial and it’s often difficult to ascertain the legit from the fake, a supposedly rare and previously unreleased King Tubby session from the late 70’s may actually turn out to the work of someone else whilst for those who buy their dub on CD (yes I am one such person) the unavailability of source tapes often results in cds being mastered from vinyl which can lead to pops and crackles, in some cases it’s less of an issue than others. As with other genres of music I listen to I quite often begin to focus around certain record labels and for dub this is most definitely the case, labels I feel can be trusted when it comes to reissuing great dub that’s a) not been tampered with and b) is packaged and available at a fair price, these are several such labels. Mick Hucknall doesn’t have many redeeming features but it must be said he’s a man with a huge passion for Dub, back in the 1990’s he helped to found Blood and Fire Records (with the legendary Steve Barrow) a Manchester based label which specialised in the reissuing of mostly Dub and Roots Reggae, I’ve bought some absolute gems on the Blood and Fire imprint including Keith Hudson’s “Pick A Dub”, Yabby U’s “Prophesy Of Dub”, Horace Andy’s “In The Light/In The Light Dub”, Glen Brown and King Tubby’s “Termination Dub” amongst others, these reissues were packaged well (with often detailed sleeve notes) were mastered properly (without fiddling with the dynamics of the original dubs) and were reasonably priced. Blood and Fire folded as a label in 2007 however it’s just been announced that the label is being relaunched later this year. In the meantime if you see second hand copies of albums pressed on this label buy with confidence. Adrian Sherwood has many redeeming features and is also a man with a huge passion for dub he founded Pressure Sounds in the mid 90s with Pete Holdsworth (who he’d worked with as part of the On U Sound System). Like B&F Pressure Sounds focus on reissuing quality roots and dub reggae, nicely packaged, great mastering, some insanely rare (but a) legit and b) great) dub has been made available again, I’ve added such gems as Dennis Bovell’s “Decibel” compilation, Joe Gibbs “No Bones For The Dogs”, The Royals “Dubbing With The Royals” and more recently a great trilogy of Lee Scratch Perry reissues (Both volumes of Sound System Scratch as well as Roaring Lion) a lot of their releases are mid price and freely available, a great label still going strong. One of the heavyweights, VP Records are the largest independent distributor of Caribbean music in the world, they’ve recently bought up the legendary Greensleeves Records back catalogue and are reissuing more and more classic roots and dub, for a CD buying heathen like me their recent “Evolution of Dub” series is a blessing, these are 4 CD Boxsets for under £20 that contain great mastered versions of many rare 70’s and 80’s dubs, Volume 7 includes such classics as Prince Jammy’s “Kamikazi Dub” and “Black Uhuru In Dub”, Volume 8 includes “King Tubby Surrounded By The Dreads At The National Arena” and Winston’s Edwards “Natty Locks Dub” more recently they’ve unearthed a complete set of dubs for Fred Locks classic late 70’s album “Black Star Liner” (released as Black Star Liner In Dub). Speaking of heavyweights probably the most recognisable reggae reissue label in the world, it’s sometimes a bit bewildering just how many albums and CD’s Trojan have reissued over the years and some of their back catalogue is better than others, again not a dub specialist label however they’ve released some great dub compilations over the years (the Trojan Dub Box Set Volumes 1 and 2, Foundation Dub and a few years back the fantastic budget priced “Trojan Presents…. Dub” 2 CD set). Sadly this label folded a few years ago, Motion was another UK based independent that specialised in reissuing rare roots and dubs, I recently bought Niney The Observers “Sledgehammer Dub In The Streets of Jamaica” and The Skatalites “The Legendary Skatalites In Dub” both great mid-late 70’s sets of dubs, nicely packaged, mastered well and mid price, real shame Motion aren’t around anymore. That’s not an exhaustive list (for example the Greensleeves back catalogue has some real gems on it (although second hand copies of the likes of Scientist’s “Heavyweight Dub Champion” are now changing hands online for upwards of £50). There’s a lot of dub out there to be explored and a myriad of labels, when I’m in doubt I tend to research the labels before buying and where possible try and find out how legitimate the recordings are, there are some great blogs and online forums out there where you can find a lot out (esp the Blood and Fire and the Roots Archives Forums) plus such online retailers as the Dub Vendor who always stock quality dub. My entry point into dub was not via the usual route, probably because I have never really enjoyed reggae music despite being a fan of many different genres. I was always slightly annoyed by this because I pride myself on being worldly with my musical tastes and in giving all music a chance whatever its style. For example, I own a copy of Metal Machine Music by Lou Reed – some people refuse to acknowledge this as music at all (!) so given these circumstances I think that makes my attitude fairly liberal. As a vinyl only collector of music I had always enjoyed the aesthetics of dub LP’s – if you stick with us here, you will come to see what I mean; the sleeve art of dub reggae albums are often worth the retail price alone. I frequently used to view the album sleeves pinned to the wall in record shops; I particularly remember the cartoon cover offerings by Scientist (more on him later). What fascinated me most was that by looking at the art work it gave you, the buyer, almost no insight into what was laid down in those grooves and part of me really enjoyed that mystery. You knew though, that whatever it was, it was going to be kind of left field, rebellious or experimental. 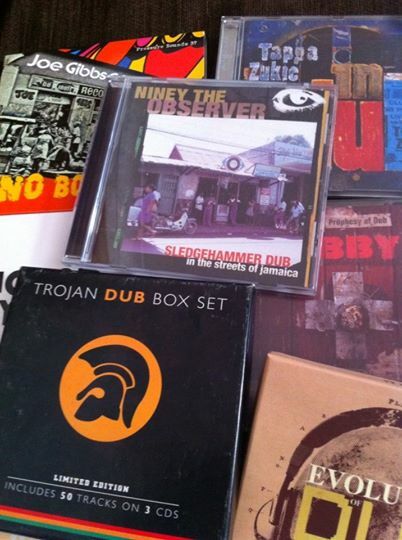 One Saturday afternoon in 2005, when I was desperate to go home with a piece of vinyl under my arm I chose a dub album. 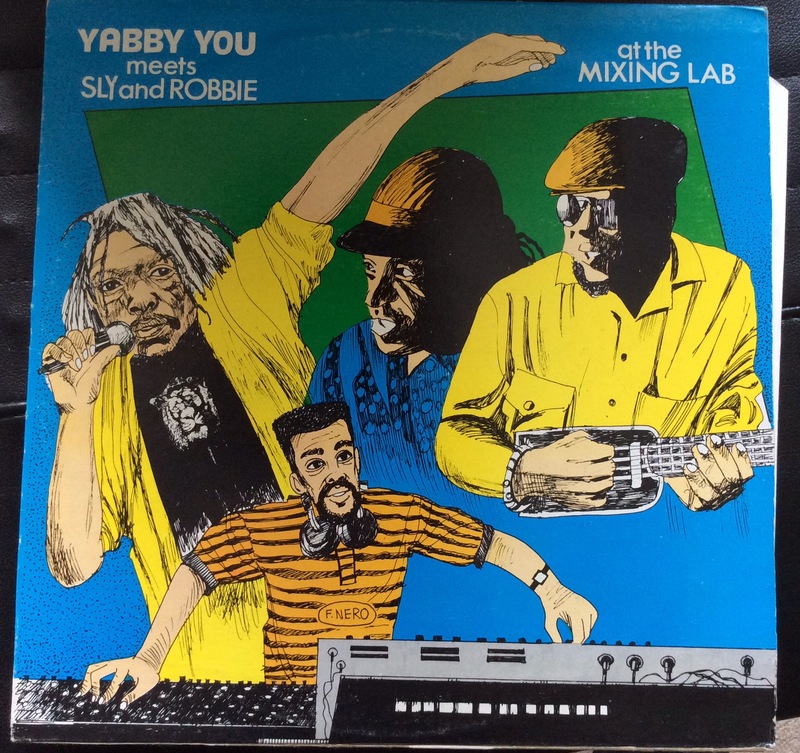 It was a random selection really; the album was Yabby You meets Sly and Robbie at the mixing lab. It was fairly cheap and had a cool cover. This album is not hailed a classic, but I had no intelligence of what I should be buying at the time. I knew of Sly and Robbie from their work with Grace Jones and knew they were highly respected. It was much later on when I came to appreciate the genius of Vivian Jackson (Yabby You). I got home after sitting down with a pint and reading the sleeve notes and slipped it on my record deck. The drums made it sound more modern than I expected, there was lots of snare which I really liked. There was plenty of echo and effects too which made it sound really sinister in places. The stripped down approach to this music was tight and focused. With reggae in general I often felt that the songs were a little bit twee – this was more serious and the driving bass lines gave it a feeling of respectability. On occasion it could be quite funky, particularly the track I.L.A dub which is still a personal favourite. There is no date on the sleeve but I found out that it was recorded in 1979 – to me though it sounds more modern than that, say circa 1983, mainly because the effects sound a little more digital in places. To date this is still my favourite Sly and Robbie offering – you never see it on any of those top 10 lists though, and in a way I think I prefer that. After this purchase I actually didn’t buy anymore dub until 2012 and I shall explain why next time. In the meantime though give this a listen it still sounds great. Come with us on a musical journey to a world of heavy basslines, percussion, digital effects, delay, echo and vocal snippets, the sound of mavericks doing whatever the hell they wanted to do, the world of Dub Reggae…………………. From the familiar (Lee ‘Scratch’ Perry, Augustus Pablo, King Tubby, Scientist, Prince Jammy, Keith Hudson, Jah Shaka, Mad Professor, Dennis Bovell) to the unsung heroes (Augustus Clarke, Prince Douglas, Ras Michael, Ja Man Allstars, Winston Edwards, Bobby Kalphat, Tappa Zukie) there is a world of dub to explore, stay tuned for further updates and dub recommendations brought to you by 2 middle aged blokes with a dub fixation aka Buddy Boy and Fella Me Lad.